Red area shows a "door zone" on the bike lane. Yes! I support bike lanes on 30th St. I'll sign the petition. As of this morning, San Diego is now a NACTO member. Welcome to #NACTO's newest member, San Diego! San Diego has finally joined the likes of Atlanta, Baltimore, Boston, Chicago, Detroit, Houston, Los Angeles, Minneapolis, New York, Philadelphia, Phoenix, Portland, San Francisco, Seattle and Washington DC. to determine how to work on finding solutions to our transportation woes and figure out how best to carve out space for all road users including the historically neglected ones like bicycle riders. The National Association of City Transportation Officials (NACTO) is a 501(c)(3) non-profit association that represents large cities on transportation issues of local, regional and national significance. NACTO views the transportation departments of major cities as effective and necessary partners in regional and national transportation efforts, promoting their interests in federal decision-making. We facilitate the exchange of transportation ideas, insights and best practices among large cities, while fostering a cooperative approach to key issues facing cities and metropolitan areas. 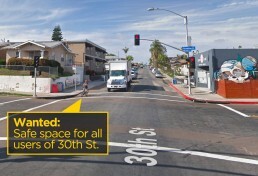 Encouraging the city of San Diego to join NACTO was one of our goals for our first year. NACTO caused a buzz two years ago when they launched their urban bikeway guide, a long overdue antidote to our very auto-centric design guidelines that our city transportation officials have had to rely on decades. This has resulted in, predictably, San Diego being a very auto-dominated city. Los Angeles was one of the early member cities of NACTO and we've had nothing but admiration for the leaps and strides that L.A. has made toward making their streets more friendly to their bicycle riding residents. We believe that a lot of L.A.'s success had to do with signing on to be a NACTO member city and then learning from and sharing with other NACTO member cities ideas and strategies on how best to accommodate all road users. BikeSD: How does a city benefit when it signs on to become a NACTO member. What are some of the downsides? What are some of the upsides? Michelle Mowery: Since my expertise is bicycling I can only address the bike aspect but NACTO gives big cities the opportunity to share ideas and design concepts within circumstances that are not often shared by smaller, less urban cities. We use the NACTO Guide as a reference as we seek to develop new and experimental projects in the city. For example we are working on a cycletrack or protected bicycle lane in the Figueroa corridor and we've looked to the Guide for examples of how we might develop the design. The downside is that the document and the designs have yet to be adopted by Caltrans (although for the first time Caltrans is in the process of developing an experimental process for the testing of new bikeways design that is a direct outgrowth of the NACTO Guide) and thus it does not protect us from liability as we move forward with testing some of these new concepts in Los Angeles. That said are taking steps to protect the city from liability as we work on these projects by working with Caltrans and the FWHA on the experimental projects. The efforts of NACTO have helped all of us who are implementing bike infrastructure to expand our tool boxes. While the Feds and the State slowly inch their way into figuring out how to accommodate all roads users in a manner that more inviting and safer than it currently is, we're certainly thrilled that San Diego has joined the growing list of cities willing to forge a new path forward. This post was written by BikeSD member and supporter Timur Ender who moved to San Diego for law school in January 2012. A year later, he moved to Portland to live in a city that has prioritized its citizens' safety, health and financial needs by providing them with safe, comfortable and inviting routes to ride a bicycle in. In moving away from San Diego to Portland, Ender turned down a $30,000 annual scholarship from Thomas Jefferson School of Law (TJSL). At TJSL, Ender was in the top 5% of his class. He said turning down a scholarship from TJSL was not nearly as hard as leaving all of the bike advocates who asked him to stay. Very rarely has he felt so honored, humbled, and valued. Cities are erected on spiritual columns. Like giant mirrors, they reflect the hearts of their residents. If those hearts darken and lose faith, cities will lose their glamour. We live in an age when Americans can live in just about any city in the country that they want. And, to a lot of people, what makes a city great is its walkability and bikeability, and a responsive local government that serves its residents and visitors. The weather alone cannot make a city America’s finest. As we have commented for years, San Diego’s bicycle infrastructure is woefully deficient and needs dramatic improvement. That is why BikeSD exists: to advocate for those changes. With the election of mayor Bob Filner and with the support of the City Council, we are hopeful that things are going to start to change for the better. The recent 40 – year transportation plan authored by SANDAG, however, exemplifies the glacial pace at which things get done in this city. So, while we are hopeful that our elected officials will finally step up for bikes, we have our doubts. There are basic, common sense steps that we can take today to get the change started. First, go ride a bike! And encourage your friends, family, local officials to take a ride. As the adage goes, “you never truly know someone until you’ve walked a mile in their shoes.” So, get on your bikes. Second, get involved. If you are interested in making San Diego a world-class bicycling city - or if you are just interested in riding improving the infrastructure so you can ride your bike more - there are groups that already exist that are advocating for you. Talk to your bike advocates from BikeSD, from the City, and from SANDAG. Third, urge your representatives to allocate money for bicycling infrastructure projects. Not all infrastructure projects are equal: while $700,000.00 may be a rounding error for a [bridge or highway] project, it's a significant amount for active transportation programs. Funding for bicycle projects should be aggressively pursued. Likewise, help your representatives understand that you “vote transportation.” In other words, make it crystal clear to your representative that you will base your vote, at least in part, on the steps that have been taken to improve bicycle infrastructure. Fourth, urge the City to properly maintain the existing bicycle infrastructure. The City should cite homeowners who routinely place garbage cans in the bicycle lanes. Further, the bollards should be removed from the bicycle path parallel to Harbor Drive. If the City is concerned about safety, a better solution is putting bicycle traffic lights and thereby legitimizing bicycling. The bollards are an inconvenience and an eyesore. Fifth, the City should pass an anti-harassment ordinance so motorists who harass vulnerable road users will be held accountable. The bicycling community has been pressing for these changes for years, from the bottom up. It is time they are met with action from the top down. We wish Timur Ender the very best for his new life in Portland and thank him for his incredible help and insight he provided us during his very short stay here in San Diego. The post below was written by BikeSD volunteer and member, Tyler Bergin. Today, the North Park Planning Committee will vote on approving the installation of two new bike corrals and the city’s first parklet. While the implementation of these cycling amenities in North Park would be a great start, more needs to be done in order to transform this up-and-coming neighborhood into THE MOST bike and pedestrian friendly neighborhood in San Diego. As many of you are probably aware, North Park was recently named the thirteenth best hipster neighborhood in the U.S. by Forbes. Whether the news made you giddy or nauseous, the fact is that this kind of national attention has brought this wonderful neighborhood into the spotlight locally as well. City and community officials now have their sights focused on North Park in order to decide how to gain more national attention and use this burgeoning hipster destination to the city’s financial advantage. Now is the perfect time to advocate for change. Recent studies have shown that the installation of bike lanes in New York and Portland have had a positive affect on the local economies. According to an NBC News article, sales at businesses along New York’s Ninth Avenue increased as much as 49 percent after installing bike lanes. As Martha Roskowski of Bikes Belong puts it “When people travel by bike, they tend to eat, shop and play more locally.” With this type of information available and our newly elected mayor’s focus on public safety, arts and culture, jobs, small business, neighborhoods and environment/livability, it would seem that placing dedicated bike facilities along the major thoroughfares in North Park would be a no-brainer. This, however, is not the case. Plenty of parking for cars at the North Park Parking Garage. While automobiles are given almost exclusive right-of-way on our city’s streets, the bicycle is left to fend for itself. Two tons of steel versus twenty pounds of aluminum; we all know which is the winner. To add insult to injury, not only are cars given exclusive right-of-way to drive on these streets, they are also given exclusive right to sit motionless on the side of these streets while bicycles are meant to be chained to a few randomly placed bike racks, not in the street, but on the sidewalk where bikes are not permitted to be ridden! One could make the argument that there are far more cars driven into North Park and removing parking from one side of the street in order to make space install bike lanes would create a huge deficiency, but this argument is invalid. At the corner of North Park Way and 30th Street sits a 388-space parking garage that four years after opening was, according to city redevelopment project manager Michael Lengyel, “generally at less than 50 percent capacity.” What better way to put this fourteen million dollar parking garage to good use and recuperate some of this cost than by removing on-street parking! So what exactly should be done in order to improve cycling infrastructure in North Park? There are three streets that could be immediately improved. Bike lanes and/or cycle tracks should be installed on both University Avenue and 30th Street. These can be simple bike lanes such as the ones that currently exist on Utah Street (perfect example of bikes being pushed onto side streets instead of main thoroughfares) or green protected bike lanes such as those that exist in New York, Portland and Chicago. Transforming the two main avenues in North Park into bike-friendly “complete streets” would establish North Park as THE bike friendly destination in San Diego. The third street that could benefit is Ray Street between University Ave and North Park Way. As the location of the Ray Street Art and Culture District, this segment could be paved and turned into a fully bike and pedestrian street by completely removing access to cars. This would be the first of its kind in San Diego and follow the success of cities such as Barcelona, Spain and Curitiba, Brazil. Additionally, it would make a great location for a new bike corral. As Councilman David Alvarez stated at BikeSD’s launch party back in September, planning groups and city council have the power to make changes, but they need to know what changes the community desires to implement. There is an old saying “The squeaky wheel gets the grease.” Let’s make sure that wheel is spoked and attached to a bicycle. North Park today: Ripe for change. In San Diego, bike lanes often get dropped at intersections which is the one place all road users need direction on how to navigate across. Long Beach began using green paint to highlight specific areas where roads users needed to be especially cautious and we see this as a very low cost solution to implement while working on actually redesigning the intersections to be more in tune with the Dutch standard. Designs for intersections with bicycle facilities should reduce conflict between bicyclists (and other vulnerable road users) and vehicles by heightening the level of visibility, denoting a clear right-of-way, and facilitating eye contact and awareness with competing modes. Intersection treatments can resolve both queuing and merging maneuvers for bicyclists, and are often coordinated with timed or specialized signals. Where do you think would be ideal places to implement this sort of treatment?